Remove the fillets and any sinews or discoloured pieces from the chicken flesh. Place each breast between 2 sheets of clingfilm. Using a rolling pin, gently beat into a thin escalope. Mix together the olive oil, tarragon, lemon zest and juice in a bowl. Add a twist of pepper and the chicken breasts, making sure that each breast is well coated. Set aside for 30 minutes. Beat together the butter, lemon juice and tarragon leaves, then mix in the diced olives and season to taste. If you have time, spoon on to wet greaseproof paper, in a rough sausage. Roll up into a cylinder and chill until needed. Otherwise, set aside, covered. Preheat an oven-top grill pan over a medium-high heat. Add 2 of the escalopes, and grill on each side for 4 minutes. Set aside and keep warm while you cook the others. Serve with a slice of olive butter melting on top. This is delicious with salad and chips or new potatoes. 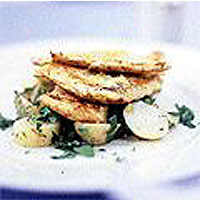 This recipe was first published in April 2001.